Volvo Ocean Race: what to expect? Slowly the details of the new 2011-12 Volvo Ocean Race are being revealed. Dates, ports, rules and routes have recently been revealed and one by one teams participating in the race are coming forward. 6 candidates seem to be sure with another 20 syndicates currently considering an entry. With the announced format changes and the increase in competitors, the newest edition promises to be a blast with all the potential to exceed the success of the last edition. It is still early days but slowly the outlines of the revised format of the Volvo Ocean Race are beginning to take shape. And it promises to be even better than the Race’s last edition. Closer racing, an increased number of teams, exciting stopover venues with great in-port races and festivities, great sailors and exciting multimedia coverage should lead to a great experience for everybody involved, be it viewer, gamer, sailor, sponsor or organizer. It’s gonna be fast and furious with loads of excitement. Let’s see where we are now….. Course and date set! The next Volvo Ocean Race will take place from 29 October to 8 July, taking eight and a half months, similar to the 2008/09 edition. A difference however is that the course is slightly longer, set at 39,270 nautical miles rather than 37,000. This time there will be 10 rather than 11 stopover cities. Similar to 2008/09 we will start with a first leg from Alicante (Spain) to Cape Town (South Africa) again passing Gibraltar as well as Fernando de Noronha off the Brazilian Coast; a traditional leg where the fleet has to deal with the famous doldrums. The second leg will go from Cape Town to Abu Dhabi, rather than to Cochin (in the last edition). As there is a risk of piracy, the fleet will have to sail around an exclusion zone. Nevertheless this will remain a dangerous leg but with a great finish in store. No doubt Abu Dhabi wants to set itself on the yachting map and we know money will not be an issue here. Next we will go to Sanya in China. No doubt the sailors are happy that they don’t have to go all the way north into the winter of China this time, battling storms etc. In contrast Sanya is the only tropical island province of China, so no complaints from the crews I would imagine. Rather than last time’s very long and tiresome leg China-Brazil, there will now be the traditional stop in between; the fleet will make in stopover in sail crazy Auckland, a stop everybody will agree with and look forward to. The Kiwis will participate with Emerald Team New Zealand in this edition and hence it promises to be an enormous spectacle. From Auckland we will go on to Itajai in Brazil, battling the Southern ocean, always one of the most spectacular legs of the race and also the longest one. Itajai marks of course a change from the usual Rio de Janeiro stop, but appears to be at least as much of a treat. Miami marks the surprising North American stop. Although Ken Read on Puma, the North American entry, might have preferred to go up north a bit further, Miami has the glitz and glamour that fit the race. On to Europe, where Lisbon has the honor to be the first stopover port and this is an honor indeed given that 34 European cities bid for hosting the race. Sailing conditions in Lisbon tend to great and of course the city has a great maritime past. From Lisbon it is on to Lorient in France, home of Groupama. This sound like a short one but this is a deceiving one; the fleet first has to head offshore again, rounding the Portuguese archipelago of the Azores before heading back towards France. Can be a clearly interesting one! Given its great yachting tradition France should be in there and Lorient should be no surprise; it has developed itself in a true European sailing center. The biggest surprise is the finish of the race. After having passed the Fastnet rock, another interesting feature, the race will end in the last edition’s succes number Galway. I had the pleasure to be a guest there during the race’s last edition and one cannot deny it, it was an outright success with more than 650,000 spectators, underlining what good marketing can do to sailing. Clearly Galway hence will be an excellent place to finish! Surprising is that Sweden, the home of the main sponsor Volvo, is not hosting a stopover. All in all the race should offer plenty of variety as far as weather conditions and variety of ports is concerned. For sailors it should be a definite improvement, also underlining that the organisation has listened to them. And as far as the stopover ports is concerned; a good mixture of fun, yachting tradition, glitz and glamour and sail crazyness, whilst simultanously with economically sound benefits! Changed in-port format should provide lots of excitement. In the new edition of the race, all ports (including the finishing one – Galway) will host an in-port race, which should be great news for the spectators. A final weekend in a stop-over port will now contain both the in-port races as well as the start of the new leg, which provides for a super weekend. Moreover, it will give both the crew and on-shore team more time to prepare, whilst for the syndicates it will result in cost savings; a win-win situation for everybody. The short course of the In-Port races and the proximity to the stopover harbours and beaches will allow the public to watch the racing up close. Virtual fun should get even better! We are just at the beginning of convergance of real and virtual……..Although details have not been announced as of yet, I am reasonably convinced the official Volvo Ocean Race Game (produced by United Games) will be even better than last time. In the last edition around 220,000 people participated in a game lasting around 9 months. Gamers had to endure many sleepless nights but also actively experienced what a Volvo Ocean Race really is all about. An absolute highlight could be found in the virtual community steering one of the boats during the last few legs; a true example how the virtual and the real world are converging. Moreover Green Dragon managed to realise its best result when steered by the gamers, proving the phonomenon of “virtual wisdom”. Hopefully, this will be repeated in the new version of the game. Even without it, there should be plenty improvements to look forward to. I would imagine social media will enter the equation, whilst gameplay and communication features (possibly with the real boats) may also be improved. We have to wait, but it surely will be exciting! No news as of yet of the multimedia front. We have not heard anything yet of the potential innovations as far as multimedia is concerned. In the last edition we had some spectacular footage of the teams on board shot by the different media crew members of the teams. Additionally some live TV of the starts of the different legs, a race viewer tool, pictures and podcasts, whilst in the mean time the Race has also entered Facebook. It will be interesting to see with what the guys will come up with to increase the Volvo Ocean Race experience. No doubt Twitter will enter the equation and for the remainder we have to wait and see what they come up with. Of course the ultimate would still be to be live on board from behind your screen, watch it when it all happens. And then the teams…..6 participants so far but more to come…Who are they? Camper/Emirates Team New Zealand. Camper and Emirates Team New Zealand have joined forces, implying a second footwear sponsor (Puma being the other) is entering the race; good news as yet another B2C sponsor feels it can realise sufficient returns. The skipper and head of the syndicate is one of the icons of sailing, Grant Dalton! It is good news for the race that this 6 times veteran and former winner is returning and undoubtedly he will play a major role. Moreover, as Auckland is one of the stopover ports, expect some Kiwi enthusiamn! Groupama: France is back and so it should be! Since the 1993/94 edition no French yacht participated in the race. The formidable Franck Cammas (the fastest sailor around the world, recently having broken the record) will lead the charge with the insurer Groupama being the main financial backer. Groupama has been around a long time in sailing and sees the Volvo Ocean Race as instrumental to develop its overseas business. With Juan Kouyoumdjian (ABN Amro 1, Ericsson 4) designing the boat and stopover port Lorient being the homebase of the team, there will be no lack of support from the French! Italia 70: Italy is back in the race for the first time since 1993/94. Giovani Soldini is the skipper to watch and with him he will bring a fully Italian crew. The environmental friendly team aims to bring together a group of companies, wwhich will be prepared to support Italia 70 throughout its entry in the next two editions of the Volvo Ocean Race. The Azurri have already acquired the Volvo Open 70 Ericsson 3, meaning the team can immediately start training. The plan is to generate a new generation of Italian sailors and build a national offshore team. Although the guys are probably not a favourite to win the race, they are here to stay and no doubt the Race will benefit from a little bit of Italian flash, design and grandeur. Team Abu Dhabi: Abu Dhabi has been announced as a stopover city, which, no surprise, had to be followed by a home team and no doubt the emirate will come out with a top notch team. The crew will be selected by the Abu Dhabo Tourism Authority and these guys are far from short of money. Although it has the ambition to include an UAE national in the crew, one can rest assure that the remaining crew members will be the cream of the crop. The team will construct the boat locally and will construct a new marina. With this proposition Abu Dhabi wants to establish itself as a high quality marine and leisure spot to the world and reestablish its seafaring heritage. Hence a lot is at stake and Abu Dhabi has the financial resources to do it properly. A sixth team is yet to be announced whilst there are currently over 20 more syndicates that are actively working on entering a team. This means the Volvo Ocean Race is ahead of the number of teams at the same stage of the last race, which is exceptionally good news given the state of the economy. The new rules (see blog article http://www.jkmconsultancy.nl/2009/10/yachting-new-rules-should-guarantee-future-of-volvo-ocean-race/) apparently seem to do the job, lowering the costs of a campaign. So we have got the New Zealanders, the Yanks, the Azurri, the French and Abu Dabi, all with some very serious names already aboard. Which sailing nations do we miss? To name a few: the UK, Australia, Brazil, Sweden, Spain, China, Ireland and my own country The Netherlands. Undoubtedly a few of the additional names (possibly another Americas Cup team, how about Team Origin?!) to be announced will come from these countries, also in view of some of them hosting stopovers, which should make it more easy to leverage their investments. Unfortunately there seems to be no Dutch syndicate in the making as of yet, but let’s hope this will change. Still a year to go……Experience it, it will be worth it! In any case, there is no doubt in my mind, the new edition of the Volvo Ocean Race will be even better than the last one, more close racing, more viewers, more competitors, more virtual reality fun, better festivals, all at lower costs! For the syndicates, sponsors, viewers and virtual players who haven’t decided yet, join!! It will be worth it! The yachting calendar counts a multitude of different events. After having witnessed the spectacle of the Americas Cup in February and the Louis Vuitton Trophy in March, focus is now turning to the Carribean and to the announcement of the final routing of the 2011/12 edition of the Volvo Ocean Race. We have attempted to list the top 10 yachting events in the world, taking into account issues like coverage, price money, quality of sailors and the history or future potential of an event. The list includes different formats of racing, such as single handed, around the world, ocean, coastal and fleetracing. Clearly the list and rankings are arbitrary but they should give an indication on which events deliver the best spectacle and value. 10. Olympic Games: the Olympics are the greatest sporting spectacle in the world and hence they should be part of our top 10. The Games have produced great sailing legends of the likes of Ben Ainslee, Ian Percy and Torben Grael to name a few. Hence the Games should be seen as a breeding ground for great sailors. Adding that the Games are also being watched by many millions of spectators around the world, we have got 2 major reasons why they should be on our list. Having said so, for television purposes the races are not as spectacular as some of the other events listed below, so work in progress we would say. 9. The World Match Racing Tour. Matchracing is the future and that’s why this event is in! It’s fun, fast and furious and hence should appeal to the younger crowd, important for the future growth of the sports. The World Match Racing Tour is attracting great talent with some of the best sailors in the world, such as Adam Minoprio, sailing legend Peter Gilmour and aces like Ian Williams and Ben Ainslee. Whereas the sport of sailing/yachting is still primarily dependent on sponsoring (particularly B2B), match racing should be very interesting for television as well as for hospitality purposes, which should give the sports a good platform to expand and to become more popular. Close to shore, short races, technical assistance such as virtual eye, on-board cameras and on-board interviews make the sport a lot more appealing to not only TV but also to different user groups. Although it is still lacking the tradition of some of the other events, the upward potential has made us decide to include it on our list. 8. Antigua Sailing Week. The Antigua Sailing Week is the biggest regatta in the Carribean and over the last two decades, Antigua Sailing Week has developed into one of the biggest events in the World Sailing calendar. It is a week of races where some of the biggest, fastest and most impressive sailing yachts in the world packed with Olympic, America’s Cup and round the world sailors are competing. Adding the variety in races, the big boats and the great party atmosphere and here we have an event that should not be lacking on anyone’s list! 7. Cowes week; the Cowes week is tradition all the way. Since 1826 it is one of the UK’s longest running and most successful sporting events. With 40 daily races for over 1,000 boats, 8,500 competitors (amateurs and professionals) and 100,000 spectators, it is without a doubt the largest sailing regatta of its kind in the world. With these numbers and this longstanding tradition, it belongs without a doubt within our top 10 of sailing race events in the world. 6 . Louis Vuitton Trophy. Maybe the Trophy has not proven its existence yet but following up on the success of the old Louis Vuitton Cup, it could be a blast! Putting together the exciting format of match racing, Americas Cup Class yachts, some of the best monohull sailors in the world (Barker, Cayard, Ainslie, Bruni) and a large crowd, makes for a great event. Adding large TV screens on site and side events in places such as Auckland, La Maddalena in Sardinia, Nice, Dubai and Hong Kong and you have a great experience that you do not want to miss. As stated before match racing has great potential for the future and that’s why we have included the trophy. 5. Fastnet race. Every sailor has heard of the Fastnet Race. It is one of the most famous offshore yachting races counting 608 nautical miles and taking place along the southern coasts of the UK and Ireland. Weather conditions always play a key role here; either big storms or relatively quiet weather determine a fast and furious or a tactical race. Similar to Sydney Hobart the Fastnet has had its share of casualties, underlining the fact the race is not without danger. With many big names participating and a long history, we rank the Fastnet at 5. 4. Sydney Hobart; say Christmas, Bass Strait, Tasmania, new year and spectacular racing and sailing fanatics filled with passion immediately will answer: Sydney-Hobart!! Without a doubt the Race is one of the most well-known iconic brand names in sailing. With the exception of the Volvo Ocean Race and the Americas Cup there is no yachting event attracting such huge media coverage. The “Bluewater Classic” has grown over the last 64 years to become one of the top three offshore yacht races in the world and now attracts maxi yachts from all around the globe. One of the reasons for the popularity of the race are the unpredictable and sometimes grueling conditions with high winds and difficult seas, sadly having also led to tragedies. 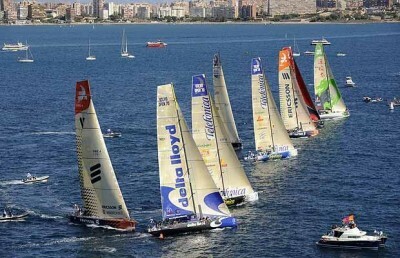 Finally a top 10 list should not be complte without a race in one of the most crazed sailing nations, Australia. 3. Vendee Globe The Vendée Globe is a round the world single handed yacht race, sailed non-stop and without assistance. The race was founded by in 1989, and since 1992 has taken place every four years. As the only single-handed non-stop round-the-world race, one can say it is probably the most extreme form of ocean racing, being a serious test of individual endurance. Not surprisingly a significant portion of the entrants usually retire, but the one succeeding waits eternal fame and prey. Names as two times winner Desjoyeaux and Ellen Mc Arthur are just some of the wellknown heroes who succeeded in finishing the race, but there are many more……the Vendee (similar to the Volvo Ocean Race) now has leveraged its race to the on-line community with hundred’s of thousands of participants. This convergence no doubt will further add to the popularity of the Vendee! 2. Americas Cup. And then there is the Americas Cup! Of course the Americas Cup should be on the number one spot! However, we chose not to do so after the recent dismantling of the Cup. Although the actual race in Valencia was awesome to watch and a magnificent display of technology, the 33rd Americas Cup sadly will go into the history books as the one mainly battled out in Court. In this perspective Larry Ellison is left with a big responsibility to regain the status that the Americas Cup should have; the world’s most prestigious sailing event. We trust Ellison and Coutts to be able to do this. Sailing is in their hearts and that’s why we believe the 34th version will be a blast! It is likely to be a multichallenger event, more international than ever before and great for spectators; there will be short furious races, cameras and microphones on-board, leading to an on-board experience and likely a new much more affordable to many boat type. It should excite young people and certainly when the Cup will take place in San Franciso, which will receive a huge economic boost as a result of the Cup. If Ellison and co. is able to do this, the Americas Cup will be the flagship event of sailing again that it once used to be. In that case the Cup will regain the number one spot on our list again. 1. Volvo Ocean Race. The Formula One of sailing! For sailors it is one of the ultimate sailing experiences, tough and asking enormous endurance capabilities. Subsequently it attracts together with the Americas Cup the best sailors of the world. Similar to Formula One team budgets have increased tremendously, limiting the number of campaigns. The new rules should improve this situation and make the race more accessible again. For spectators the race offers plenty. The boats are like race horses reaching enormous speeds in wild conditions at sea offering some good pictures and films taken by on-board media guys. 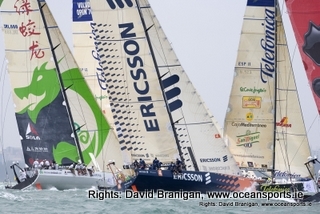 Additionally (similar to the Vendee) the Race has converged with the on-line community that even assisted the Green Dragon in the last Volvo Ocean Race. The Race is attracting huge gatherings in the ports where the fleet makes a stop-over. In these ports a variety of side events combined with in-port races guarantee a great experience and a great boost to economic activity. The combination of the best sailors and boats in the world, endurance, round the world, experience, economic and media impact makes the Volvo Ocean Race the best package in our opinion and that is why it is the number one on our list! No doubt the list offers plenty of room for debate. Feel free to comment, add or delete events and share your opinion!